Ice stumbling, drunken in a cold snowed-in valley. A shadowed valley where no roads are gritted but you pay premium council tax. The moon is lamp-bright, white on blue on white. As we climb the cobbles to the river above the village. 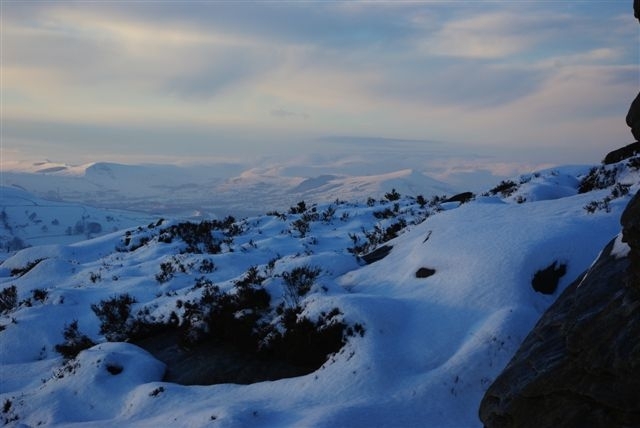 I see Kinder Scout and Mam Tor are blue and smooth with snow, giants in their winter mossy-coats. We reach a gate and have the immediate desire to trespass, reclaim lost highways and trampways. Breathtaking, breathalysing. Beer-heavy we quickly slide home.